Israeli cuisine is back, and this time with a Mediterranean brunch filled with fresh flavors of the Middle East. 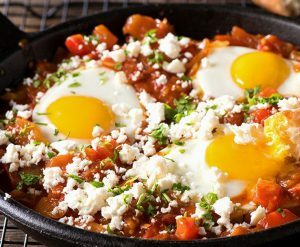 We will learn to make the Israeli version of shakshuka, (a dish of eggs poached in a spicy tomato sauce) along with some breakfast salads, a variety of burekas, pashtida (a crustless quiche) and more. This could serve as a lovely supper as well. Containers for leftovers are welcome. Please bring $15 for ingredients.